Video is in three parts. Listen one at a time, or all at the same time! 27′ 10.554″ for a percussionist is the last piece of a collection of works written between 1953 and 1956. Cage never completed this grand project, but in the three years of its construction, he wrote several parts: six short pieces for a string player (1953), an unfinished work for magnetic tape (1953? ), an unfinished work for voice (1953? ), 34′ 46.776” for a pianist (1954), 31′ 57.9864” for a pianist (1954), 26′ 1.1499” for a string player (1955), and 27′ 10.554” for a percussionist (1956). As a whole, this collection of pieces has been given the suggested title The Ten Thousand Things, most notably by Cage scholar James Pritchett. 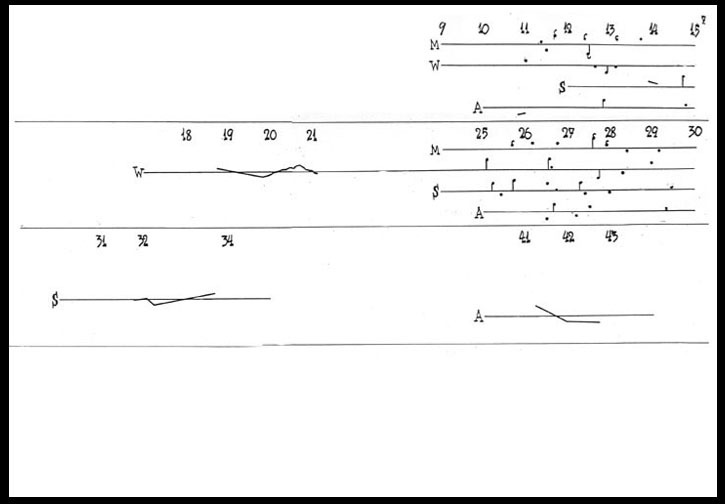 Cage’s original plan was to compose a number of works for various instruments and/or electronics which could be performed alone, superimposed on top of the other works, or even superimposed on parts of the same work; for example, the first commercial recording of these works includes simultaneous performances of 45′ for a Speaker, 34′ 46.776” for a pianist, 31′ 57.9864” for a pianist, 27′ 10.554” for a percussionist, and 26′ 1.1499” for a string player. Cage viewed this project as a work “in progress” and intended to continuously add to the collection. Each work in The Ten Thousand Things is designed within a complex local rhythmic scheme that fits within the larger structure. 27′ 10.554″ for a percussionist shares the same structure with the three prior pieces: 5 sections (with proportions 3, 7, 2, 5, 11) divided into 28 units, which are each divided into 5 phrases. The 28 units are delineated in the score by dotted lines and can be removed from the whole work. These removed sections can be performed separately, superimposed on other sections of the work, or superimposed on an equal number of sections taken from the other works in The Ten Thousand Things. Cage specifies that it “may be performed as a recording or with the use of a recording,” as many passages include articulations too numerous to be executed by a solo human performer. This evening’s performance will make use of prerecorded sounds and digitally processed live sounds to achieve the indicated music. 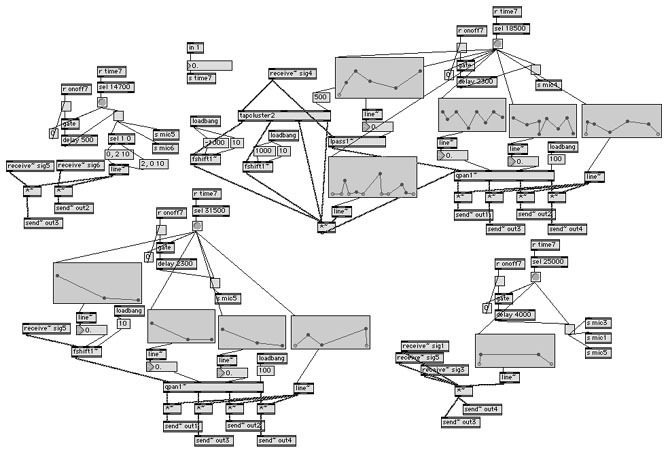 The musical material was derived through chance operations. These pieces are some of Cage’s first explorations of chance-derived music, in which the composer’s intuition is removed from the process, allowing the completely free “divine unconscious” to take over. Cage wrote of the use of these techniques, “I freed myself from what I had thought to be freedom, and which actually was only the accretion of habits and tastes” [letter to Pierre Boulez, 1951]. Chance operations in this piece are primarily by way of the I Ching (the Chinese Book of Changes) and by using imperfections in the paper on which the work was written. Beyond determination of instruments, sounds and playing techniques, the performer has no hand in the composition of the work, unlike many of Cage’s later works in which chance operations are executed by the performer prior to and sometimes during the performance. This distinction delineates the works in The Ten Thousand Things from later works in Cage’s career; 27′ 10.554″ for a percussionist is the last work in a period sometimes called “classic” chance composition. The I Ching is a book that dates back five thousand years. It contains scripts that deal with the divination and wisdom of the Chinese religions and is used to assist people with changes in their lives. Coins are tossed, the results of which (heads or tails) determine a particular hexagram (a combination of six lines, some broken and some unbroken), which corresponds to a passage of text. Each hexagram has a number. It is these numbers, rather than the text, that Cage used to design the music. -the type of event (either points, lines or a mixture of points of lines). How Cage determined the exact location of each point within these restrictions is unclear. It is, perhaps, this point at which Cage decided the indeterminacy was realized well enough and thus an arbitrary placement of each point by the composer is acceptable. In his subsequent period of compositional processes, Cage would have likely stopped and let the performer (or some other real-time chance operation) determine these details. This evening’s realization of 27′ 10.554″ for a percussionist contains extensive musical quotes including those from John Adams, Georges Aperghis, JS Bach, Bartok, Beethoven, Boulez, John Coltrane, Bill Cosby, Cypress Hill, Gesualdo, Los Munequitos De Matanzas, The Police, Schumann, Ruth Crawford Seeger, Sesame Street, The Shaggs, Steely Dan, Tchiakovsky, songs of a small tribe of Jews in Uganda, Iannis Xenakis and others, many of which will be unrecognizable, but keep your ear out. Some silences in this piece are quite extensive, the longest lasting nearly a minute. These are not musical silences but rather real-world silences. It is likely that Cage would view any unintentional sounds in these silences as an addition to, rather than a distraction from, the musical experience. Attached are two excerpts from the piece, one from the score (minute seven) and one from the schematics for the electronics in minute seven. The score excerpt exhibits many of the types of notation found in the rest of the piece (points, lines, mixtures of points and lines, silences, etc.). The electronics map is only one of a few dozen such maps. Learn more about John Cage at johncage.info.